Thank you for buying the new Energy Extra Battery 5000. We hope that you enjoy it and that it turns into your best ally for your everyday life. This portable and rechargeable power bank with 5000 mAh capacity is ideal to recharge the battery of your tablet, smartphone, multimedia player or other devices wherever you are thanks to its integrated cable, additional USB port, ultralight and practical pocket-size design. We recommend reading this manual in order to make the most of the product features before you start using it. Output: 5V / 2000 mA USB type A to charge all type of devices. Specifically conceived for charging smartphones. Reliable, efficient and light lithium polymer battery that keeps fully charged the longest time possible. Built-in micro-USB cable to avoid tangles. Additional USB Type-A output to connect any charging cable and charge any type of devices including Iphones. LED charge and on indicator. Ultraslim and compact design to carry it always along with you. 1 x Energy Extra Battery 5000 with built-in micro-USB cable. Connect the built-in micro-USB cable (1) to the micro USB output port of the device you want to charge. You can also use your charging cable by connecting it to the additional USB Type A output port (4). The charging process will start immediately and the LED indicator (2) will light. Once the charging process has finished, disconnect the device and the Extra Battery will turn off automatically. Connect the charging cable of your smartphone or tablet to the micro-USB port of your Energy Extra Battery (3). The charging process will start immediately and the LED indicator (2) will light. If you use both outputs to charge two devices, the required charging time will increase. Please take into account that charging your Energy Extra Battery and other device simultaneously may result in a reduction of the battery life. Can I use any USB cable? 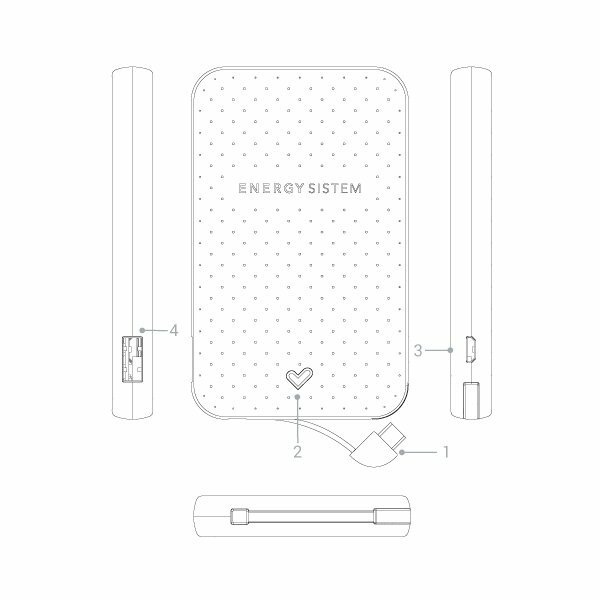 Your Energy Extra Battery has a built-in cable to connect micro-USB devices. Another option is to use the USB Type A output to connect any other compatible cable that you have already at home. For devices with special outputs like the ones from Apple, you can use the original cable that belongs to them since you can connect one end of the cable to the USB type A outlet of your Energy Extra Battery. Which output rating will use my Energy Extra Battery 5000 to charge my devices (smartphone, MP3…)? The output rating will depend on the battery capacity of the device that you want to charge. Smartphones, for instance, usually have an approximate charging capacity that goes from 1400 to 2200 mAh depending on the model. When your Energy Extra Battery is fully charged (100%), it has a capacity of 5000 mAh. Nevertheless, energy is lost in the charging process and there are other factors like the use that you make of your phone and its settings because it can keep consuming energy, especially if the device, Wifi, 4G, etc, are on. How much time will it take to charge a device? It will depend on the battery capacity of your device. Both outputs of your Energy Extra Battery have 1 Amp output capacity, the same capacity that most original chargers on the market offer. Therefore, the charging time will be more or less the same. If you use both outputs at the same time, it will take more time to charge. How much time will it take to charge my Energy Extra Battery? It will depend on the output power of the source that you use to charge it. If you use a computer, it will take longer than if you use a smartphone or tablet charger since the last mentioned have been conceived to charge devices. The charging process may take between 4 and 10 hours. Protect your Energy Extra Battery from jolts, dust, direct sunlight, humidity or high temperatures and keep it away from ignition sources. Do not use abrasive or corrosive cleaners. Keep your Energy Extra Battery clean and free of dust using a soft and dry cloth for this purpose. Please clean the battery when it is off and not connected to the power grid. Do not try to dismantle your Energy Extra Battery. Any repairs must only be carried out by qualified staff of Energy Sistem Technology, S.A.
We strongly recommend that you keep your Energy Extra Battery charged if you are not going to use it for a long period of time. Energy Sistem Technology, S.A. is liable for any lack of conformity which exists at the time the goods are purchased during a period of 36 months. Lithium Batteries are excluded from the 36-month warranty, having a warranty period of 24 months. This warranty covers any defects in workmanship or materials. This warranty does not cover any failure of the product due to accidents, misuse or alteration made by an unauthorized person. Visit the Support section at http://www.energysistem.com/en/support and select your product to view the FAQ (Frequently Asked Questions), user manuals, drivers and updates available, submit a query to the Technical Service or manage the warranty. Alternatively, you may prefer to contact the distributor from which you purchased the product, presenting the purchase receipt or invoice. All company, brand and product names are trademarks or registered trademarks of their respective companies. Manufacturer Name: Energy Sistem Technology, S.A.
Is in compliance with the essential norms and standards of the Directive 2004/08/CE of the European Parliament and the Council of December 15th 2004. You may request a copy of the declaration of conformity at C/ Calpe, 1 - 03509 Finestrat - Alicante (Spain) Tel. +34 966 831 05.